Not many people go from being a slightly critical customer to the person eventually running it, but that’s what happened to Peter Bragg, the sales and marketing director of Shutt Velo Rapide. After a short spell working with the team in Ilkley, Yorkshire, Bragg returned to his job at a data company in Cambridge before deciding to join Shutt permanently. Shortly after, the original founders decided to take a step back and Bragg took over the day-to-day running of the company. In 2011 he moved the office nearer to Brackley, Northamptonshire, closer to his home. 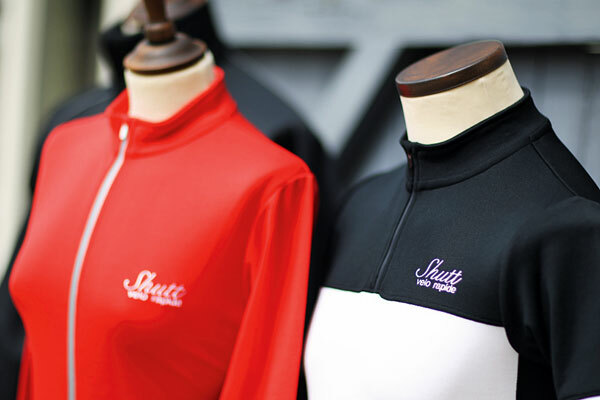 Shutt prides itself on being manufactured in the UK. While some of the company’s clothes are outsourced to the Far East, its core product ‘heritage’ range of jackets, caps and jerseys are made in Leicester. “The thing that attracted me initially to Shutt – and is still the core essence – is the Britishness. There aren’t many other companies that are manufacturing performance cycle wear in the UK,” Bragg said. As well as clothing, Shutt runs its own cycling club and sponsors two teams, women’s team Squadra Donne and men’s team Twenty3c-Orbea. Despite starting his career at multi-national corporation IBM, Bragg feels at home in the small business environment. Recently Bragg returned from a cycling holiday in France. Unsurprisingly, he did it decked head to toe in Shutt clothes. “I just love putting on one of our jerseys,” he said.